Winter inversions in Utah sometimes seem to last so long we start to think they will never end. Views of the Wasatch become foggy, covered in a layer of air pollution. Our views of mountain ranges and downtown skyscrapers are impeded, and the distance we can see is dramatically reduced. Inversion days add up one after another, and we anxiously await a storm – not only to bring fresh powder to the ski resorts but also to bring us fresh air. We notice the air is the cleanest after a snowstorm. So how can we do our part to keep it that way? Aside from the arrival of cleaner air, there is something else that happens after a snowfall. Driveways and sidewalks need to be dug out – so we dig out the snow blowers. Unfortunately, that begins the build-up of air pollutants and gives the next inversion a head start. In fact, snow blowers are relatively large contributors of emissions. The Department of Environmental Quality (DEQ) estimates operating a typical 4-stroke gasoline snow blower for one hour emits as much pollution as driving a car 339 miles! Converting your dirty, gas-powered snow blower to a clean, electric machine is one way you to help keep clean air clean. DEQ, Rocky Mountain Power, and UCAIR are partnering for the first-annual 2018 Electric Snow Blower Exchange. The Exchange will offer 432 electric snow blowers to be sold at a discounted price to encourage the use of clean-emissions snow blowers during the inversion season. The Exchange encourages participants to turn in their existing gas-powered machines in exchange for an electric snow blower but is also open to anyone who does not have a gas-powered snow blower to scrap. The difference is the purchase point. The Greenworks 80-Volt Cordless Electric Snow Blower with battery and 4-year warranty retailing at $299 will be available for discounted purchase. Those wishing to participate can register online at www.ucair.org between October 1 and October 11, 2018. Participants will be randomly selected from the pool of registrations and will be notified October 15-22, 2018. Those selected will need to pay in advance and choose a 15-minute time slot to exchange. This program is funded by DEQ’s Clean Air Fund, Rocky Mountain Power, and UCAIR. The Clean Air Fund is made up of voluntary contributions from taxpayers like you. If you’d like to see this program continue for years to come, consider a donation on your income tax forms. After switching to an electric snow blower, you will be able to breathe a little easier about firing up a snow blower right after a snow storm! Monday, October 1, is the opening day of registration! 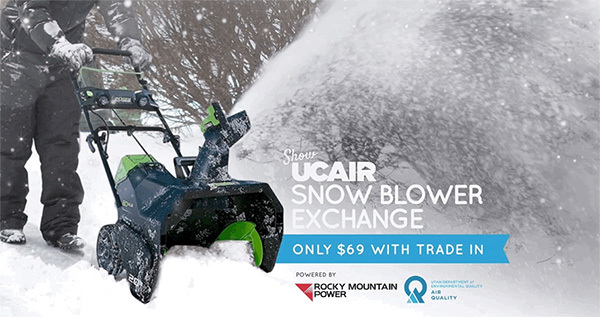 Visit the UCAIR website between Oct 1-11,2018, to register for your chance to purchase an electric snow blower at a deep discount. We hope to see you there! Some may say I’m a Utah-transplant. 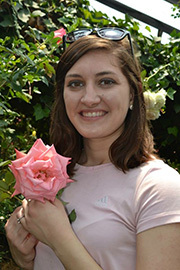 I am originally from the Midwest where I grew up in a self-sustaining family with strong environmental values. Since then, I have found myself all over the map understanding how people all around the world develop and sustain relationships with our planet. I have spent the last few years diving into cultures in 24 countries and living in four of them. Before moving to Utah this past January, I became a graduate of the University of Dundee in Scotland where I completed a postgraduate program in Sustainability and Climate Change. These days, though, you’ll find me on a mountain bike or in a tent somewhere in the mountains.